Could Liquid Lakes Form on Mars Today? 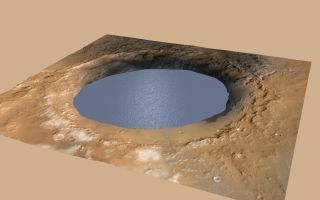 A simulated image of a lake filling Mars' Gale Crater in the ancient past. New research suggests that lakes could form on present-day Mars and, if deep enough, could last at least a year, though they would quickly form an icy crust. The idea that water could flow on Mars today has been explored since the 1980s, but as far as Goldspiel knows, no one has explored the idea of how long it could remain liquid at various depths under today's conditions. Although no signs of the ice packs that would hint of these lakes are visible, that doesn't mean they couldn't form in the future under present conditions. But for these pools to build even temporarily, the water would have to flow quickly and the pools would have to be deep, Goldspiel said. "The cold [water] isn't necessarily going to freeze faster than the warm [water]," Goldspiel said. "The deep [layer] freezes faster than the thin [one]." Follow Nola Taylor Redd on Twitter @NolaTReddor Google+. Follow us @Spacedotcom, Facebook or Google+. Originally published Space.com.